But let's back-peddle a bit. When I came back from India (read about my yoga teacher training experience here and here), I initially thought I was going to keep going with just yoga. I was loving the new-found flexibility and mindset from my training and was completely encapsulated by the yogi world. But I ended up fracturing my toe on the last day of YTT and when I came back to Sydney, I couldn't do much yoga - no down dogs, no balancing poses, no warriors. Zip, nada. After a week of sulking and feeling miserable about myself, I decided to do some upper body weight sessions and general strength exercises, just to move my body and do something. When Blake from 6W2S asked if I wanted to join their next 6-weeks intake, I initially thought "Ohhh I'm going to lose all my flexibility" and "I should be doing just yoga to keep the momentum going", and so I was a bit hesitant. I've also been careful in recent years when it came to committing to any kind of x-week-long program, whether it be food or fitness-related, just because I'm aware that those things used to be quite triggering for me. The last programs I followed were BBG (which I did by myself in the gym) and then I Quit Sugar. So you could say I'm a bit of a boot camp newbie, especially when it comes to doing something in a group atmosphere. But the main selling point for me was that I was craving some sort of a routine. While I was India, I had such a good routine and in having that, I realized that it was something missing from my life in Sydney. Yes I was working out regularly, eating fairly healthy etc, but I just felt like there was no structure to it. I didn't go to bed and wake up at regular times, I didn't eat at regular times, I didn't exercise at regular times, I kind of just 'winged' my days most of the time. And so I was hoping that 6W2S would take the guessing game out of the day and help me create a better routine for myself. And just to get this out of the way for anyone who's wondering: I am not getting paid to promote this program or to write a blog post about it. I am doing it because I've had the best time ever with it and really want to share some of the things I've taken away from it. I'm not just promoting this specific program (for all y'all non-Sydney peeps) , but rather the idea of joining a boot camp like this in general because I think it's DOPE and comes with so many unexpected benefits. The 6w2s program (yep that's abbreviated for six-weeks-to-sexaaaaay) is all about getting fit and strong in a social and supportive environment with the aim to lose fat and create lean, strong bodies. A complete 6-week challenge includes 5x group training a week, a nutrition program, support (Facebook group + coaching calls with Blake) and a community atmosphere. You'll also be doing weight ins, beep tests, strength tests and body fat tests at the beginning and end of each program, which I personally love because it really allows you to track your progress. I'm in Group 4, which means I have my workouts at either 5:45am or 6:30am and one Saturday session at 7:30am. 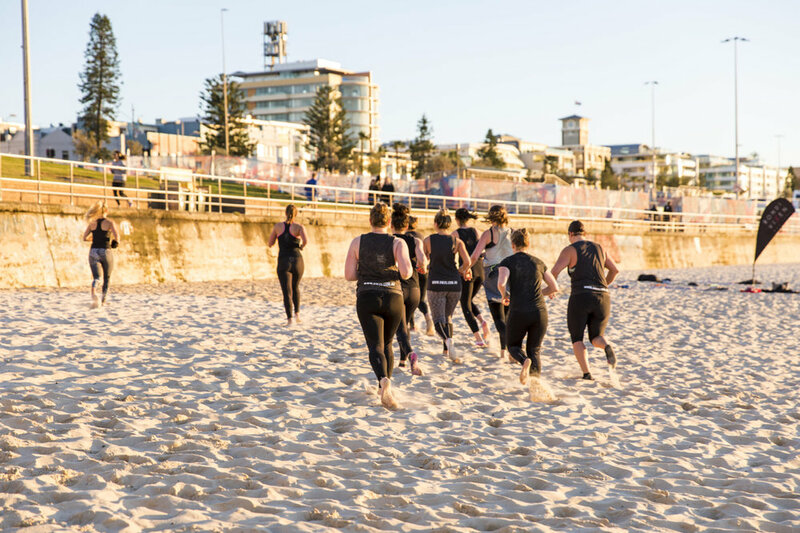 The three weights workouts that require equipment are at the main gym in Paddington, one cardio session is at Rushcutters Bay and one at Bondi Beach. My fave is obviously the one at the beach (duh), because you get to have your toes in the sand and watch the sunrise as you do burpees. Win! After the first six weeks, I feel like I'm almost back to my strongest I've ever been. I am amazed at how quickly the body can change when you dedicate yourself 100% to it! I showed up and did the work every.single.day - I trained hard, ate clean whilst still treating myself to 1-2 cheat meals a week, and really gave it my all. It's so satisfying when you know that you know you pushed yourself and stepped outside your comfort zone with every workout. PS: Weighing myself or getting a BF% test done used to be incredibly triggering for me - a 0.1kg increase in my weight could have me spiraling back into feeling like crap about myself, even if I felt totally fine before the test. Isn't it funny how that works...? Just because a piece of paper tells you you've gained weight you INSTANTLY feel less worthy...For that reason, I've avoided any kind of weighing/scaling/measuring/tracking for the last years. Not because I didn't feel strong enough to deal with the outcome, but because I wanted to detach myself of the importance that those things held over me. I wanted to learn to listen to my body and go with how I FEEL rather than what a piece of paper tells me. And for anyone struggling with an ED or body image issues, I think that's the only way forward, at least for a little while until we learn to have a better relationship with those numbers. You've got to learn to no longer give those numbers any importance, especially the weight number because that's the least relevant one! Getting fitter doesn't just mean being able to lift more weights at the gym. The moment you start working on your fitness, the confidence that you grow there begins to bleed over into other areas in your life. Being able to do 10 push ups means I have the resilience to show up for myself when things get tough. Being able to do 15 burpees means I know I can push through even when I want to stop. It sounds silly but it really does work like that. Don't just work out to grow your confidence in your fitness/body, work out to grow confidence in your LIFE! Since I started the program, I've gotten back some of the confidence that I think I lost from not having a goal/purpose-oriented workout routine. Of course this has to do with the fact that I feel more comfortable in my own body, but also because I just feel more accomplished, more resilient, stronger and in the flow. This is the main reason why I decided to do the program. And the second I started getting into a routine with the program, I realised that wowzers this has been the missing link all along! The secret sauce, the magic pill, the missing ingredient that I had been looking for all along. If you think about it, it really makes sense. We humans are wired to crave routine, even if we like to think of ourselves as spontaneous, adventure-driven free-spirited explorers. When you wake up with no idea what you're doing that day, you are so much more likely to feel stressed, anxious, overwhelmed and like you're falling short of your goals and true potential. Time just passes you. But when we adhere to a routine and stick with it, it helps build self-confidence and gives us a sense of tremendous satisfaction. A daily routine also takes away the guess work. I feel so much more at peace knowing where I need to be, and when, and not having to think about how/where/what I want to train that day. It's all taken care of for me. And because my workouts are taken care of, everything else just kind of fell into place as well. I now have so much more structure around when I wake up (5am), when I go to sleep ( I try to be in bed by 9:30pm), when/where and what I eat, when I meal prep (Saturday's) and when my active rest days are (Sunday and Monday). It just FLOWS. That's the most accurate word. I feel like everything is just flowing, exactly the way it's supposed to. And for the sake of complete honesty: I haven't had a real single binge since on the program, so for 9 weeks aka over 2 months. Which is kinda a big deal, because before this I still had little hick ups here and there. So yeah, victory! For the longest time, I considered myself more of a lone wolf when it came to working out. That's slowly changed over the years, and I am enjoying exercising in a group setting more and more. All the girls from the program and the coaches (big shout ot to Blake, Kirky and Jesse) have really grown on me and there's just something very special about sweating it out together in the early AM. Talk about fun bonding times. So there you have it, that's what I've been up to for the last 9 weeks. If you live in the Eastern Suburbs and are thinking of joining the next round, hit me up if you have any questions. And for everyone else, seriously consider giving a boot camp like this a crack yourself if you're up for a challenge, want to train in a group setting, get into a healthy(er) routine AND see results. The total cost is $695 for the six weeks if you pay upfront, or $695 with a $195 deposit and then 5 weekly installments of $100. There's also a ‘friends with benefits’ payment plan which is $1200 (saving of $95 per person) for two people - so grab a bestie and do this together?! The new intake is Nov 20th – 23rd of December (only 5 weeks due to Xmas). Are you in? You can sign up here.